Kim Kardashian Responds To Naomi Campbell Shading Her As A Fashion Copycat! Home › Kim Kardashian › Kim Kardashian Responds To Naomi Campbell Shading Her As A Fashion Copycat! Kim Kardashian West is giving credit where credit is due. As we reported, Naomi Campbell has been seemingly shading the 38-year-old superstar and Kylie Jenner by posting throwback photos of herself modeling outfits similar to ones the famous sisters have been wearing on Instagram as of late. Now, it appears Kimmy Kakes has caught wind of Naomi’s frustration, and is bending the knee to the OG. On Monday, the KKW Beauty mogul posted a series of pics in the multicolored vintage Versace dress she wore to Chance the Rapper’s wedding earlier this month — the same piece Naomi modeled in Versace’s Fall 1996 show. There you have it! Kim concedes! We’re sure Naomi appreciated the shout out because gurl has been making a bit of a fuss about the alleged fashion hijacking over the past few weeks. 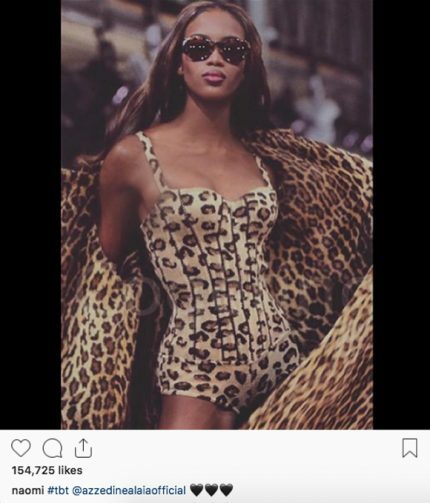 Many fans started to take notice earlier this month when Kanye West’s wife posted a picture of the look she recently wore to Paris: a head to toe leopard print Alaia Azzedine bodysuit — then, days later, Naomi posted a throwback pic from 1991 in which she was also wearing a full leopard print Alaia ensemble. If the shade wasn’t apparent, the model made a much more on-the-nose statement a week later after Kylie posted a photo of herself wearing diamond sunglasses. Two days later, wouldn’t you know it, Naomi posted a throwback pic in which she was also rocking diamond shades. Naomi didn’t stop there. Days after Kim brought back the Versace dress for Chance’s wedding, the model shared a photo of herself modeling it on the runway on her Instagram Story. Friendly fire or not, the model was pretty much catwalking the reality star into a corner. Kim had to fess up or continue to have throwback receipts thrown in her face — and, even worse, the faces of her hundreds of millions of followers. We’re glad Mrs. Kardashian-West did the right thing. But will naming Naomi as her fashion inspo lead to an Insta-ceasefire, or just make things worse for Kim? Only time (and her wardrobe choices) will tell.